June has been a particularly busy month for us up at Arkaba with various conservation projects! We finally began our rabbit warren mapping process having received our site clearances from the Adnyamathanha Traditional Lands Association Aboriginal Corporation (ATLA). We are delighted to finally be in a position to target yet another unwelcome feral species in an effort to improve Arkaba’s environment and as a result, make a massive contribution to both vegetation recovery and the arresting of soil erosion issues across various parts of our landscape. So far we have successfully mapped and GPS logged over 32 kms of land with in excess of 60 warrens ear marked for destruction later in the year when temperatures rise, soils dry out and conditions are more favourable for phase two of the operation. "This will not only reduce the pressure on our vegetation and limited water availability, but also reduce the availability of prey for feral predators such as foxes and cats which will have a subsequent direct impact on their populations. Less rabbits ultimately results in less cats and foxes." Our second major project was the successful baiting of the entire property with 1080 meat baits to target foxes. Our feral fox population has been heavily targeted since we started our management programs and this ongoing activity is vital to ensuring the fox population is kept at a minimum and our little native critters are given maximum protection. In total, 112kms of tracks were baited with a total of 366 "1080 baits" at GPS recorded locations. These baits will remain in the system for a total of 3 weeks before we retrace our steps to collect the valuable data and record just how many baits were consumed in order to keep an accurate set of records based on the feedback we receive. Finally, we embarked on a major feral cat offensive in two critical corridors on the conservancy. The first being an area of sensitive habitat in the vicinity of our Yellow-Footed Rock Wallaby colonies and the second, in a crucial area where we hope to see the reintroduced Western Quoll (Idnya) populations expand over time. These cat trapping transects spanned a total of 16km and 19km respectively and required the deployment of 30 cage traps. With our staff camping out at the two locations for a period of 5 days, we were able to trap for 4 consecutive nights resulting effectively in 240 trap nights. 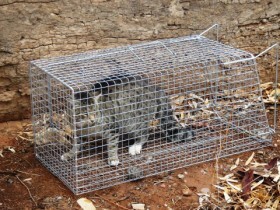 "A total of 8 cats were taken from the system during this exercise which, considering the amount of traps set, is a very good result indeed. One of the larger male cats (weighing in at 5.1kgs) had a total of 16 animals in its stomach! All of these animals are now being processed for DNA samples and their data will be added to our ongoing feral mapping." For more details about Arkaba and opportunities to engage in conservation with the team, please click here.